At the beginning of July, our family traveled up north to MA to celebrate my Aunt and Uncle's 50th Anniversary! 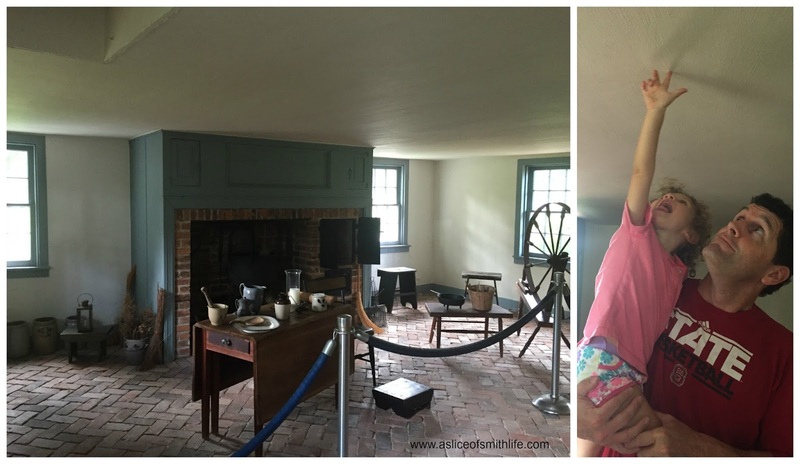 On our way up to MA, our family decided to do some sightseeing along the way to help break up our 15 hour drive. 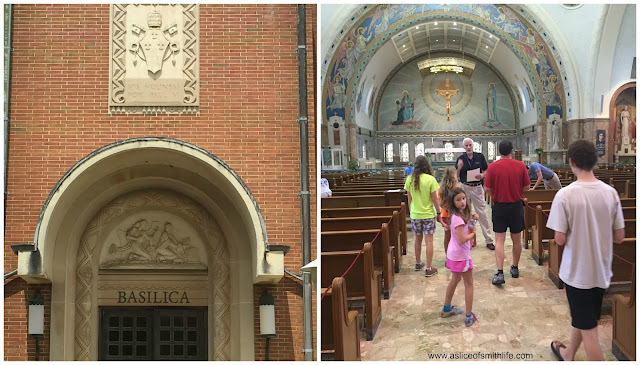 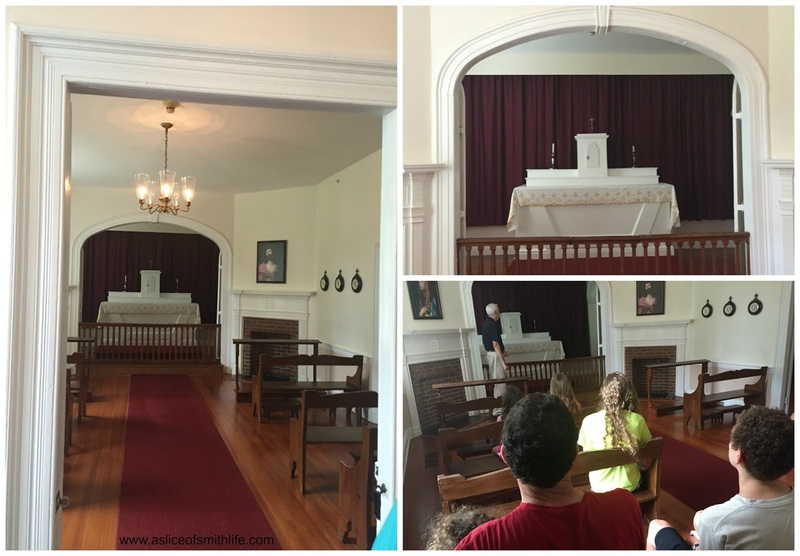 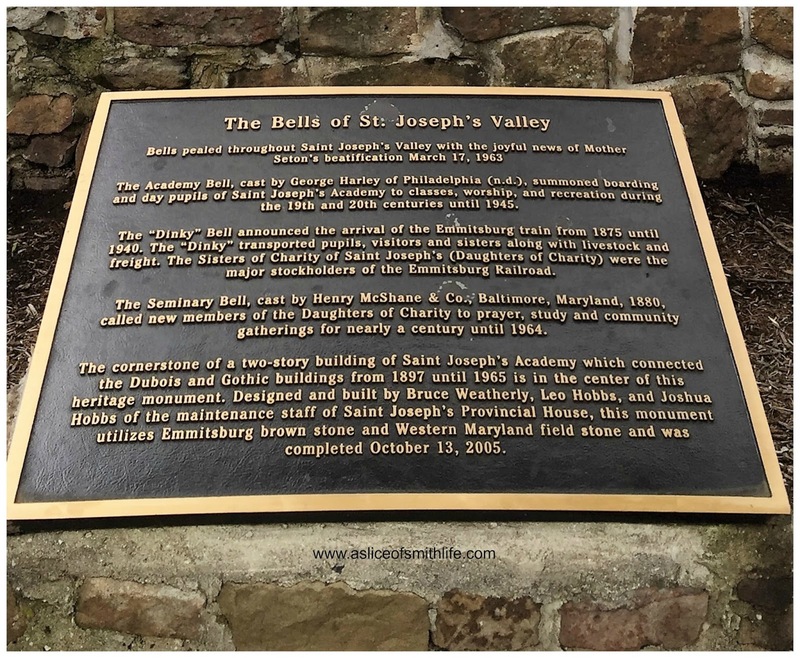 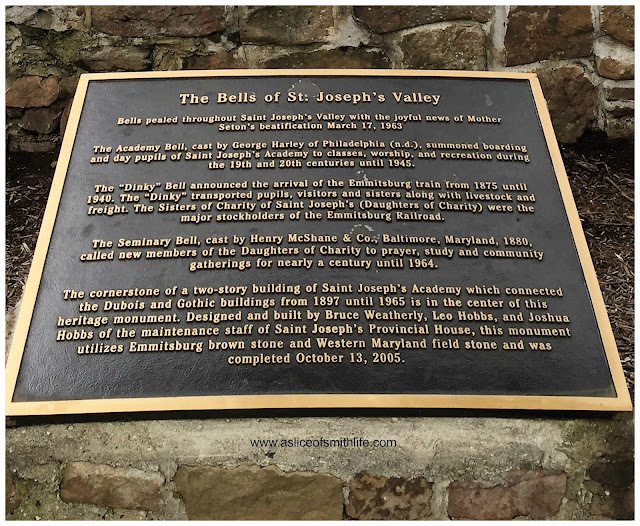 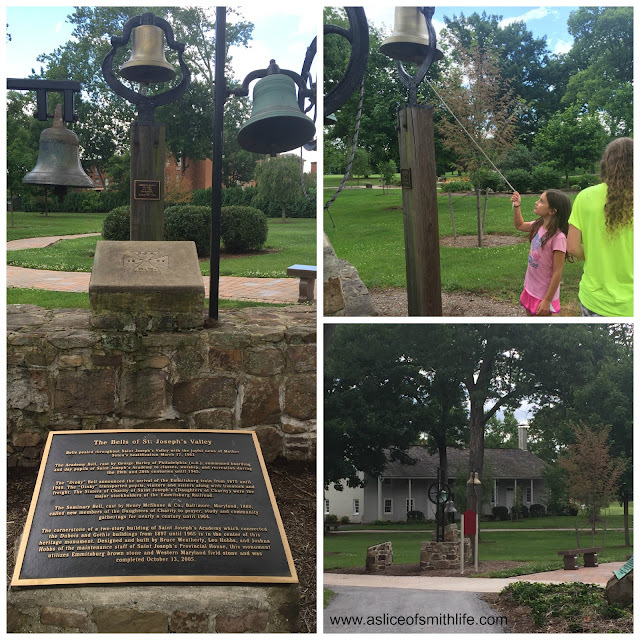 We left at 5:30 AM Tuesday, July 5 and at 1:00 PM we stopped in Emittsburg, MD to visit the National Shrine of Saint Elizabeth Ann Seton. Saint Elizabeth Ann Seton was the first American-born Saint and she had a very fascinating life! 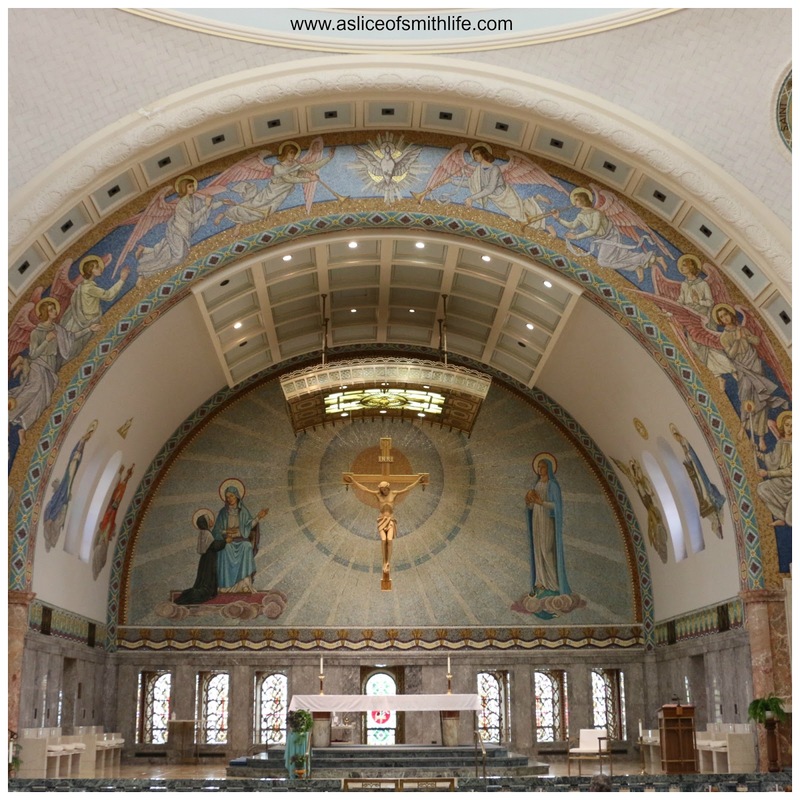 The Shrine was such a beautiful, peaceful place! Here are some photos we took with some documentation. 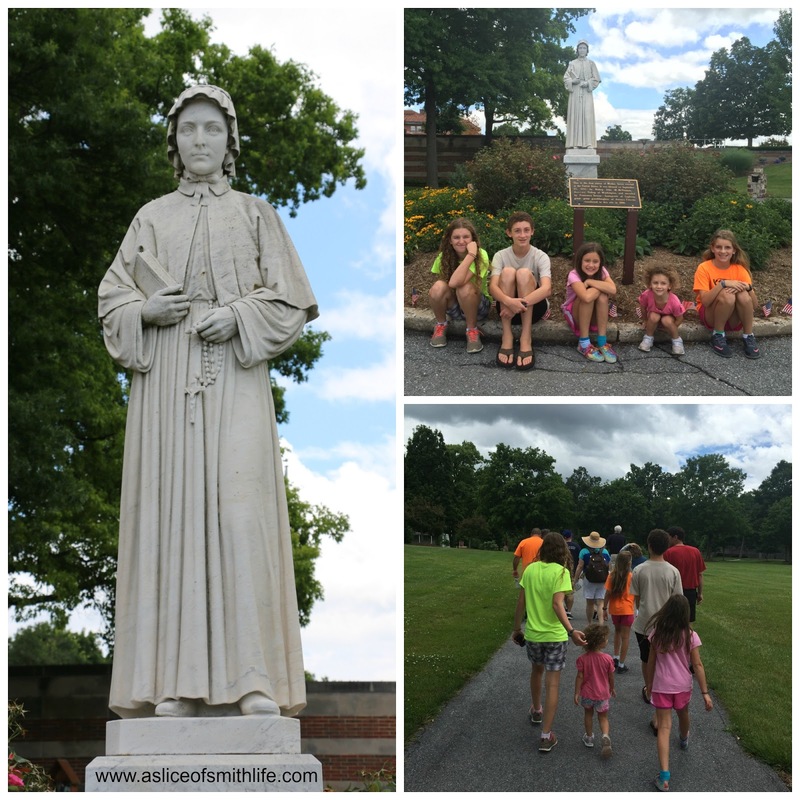 We arrived in the afternoon after our long car ride just in time to catch a 1:00 PM tour around the campus where Saint Elizabeth Ann Seton lived and taught during her years in MD. 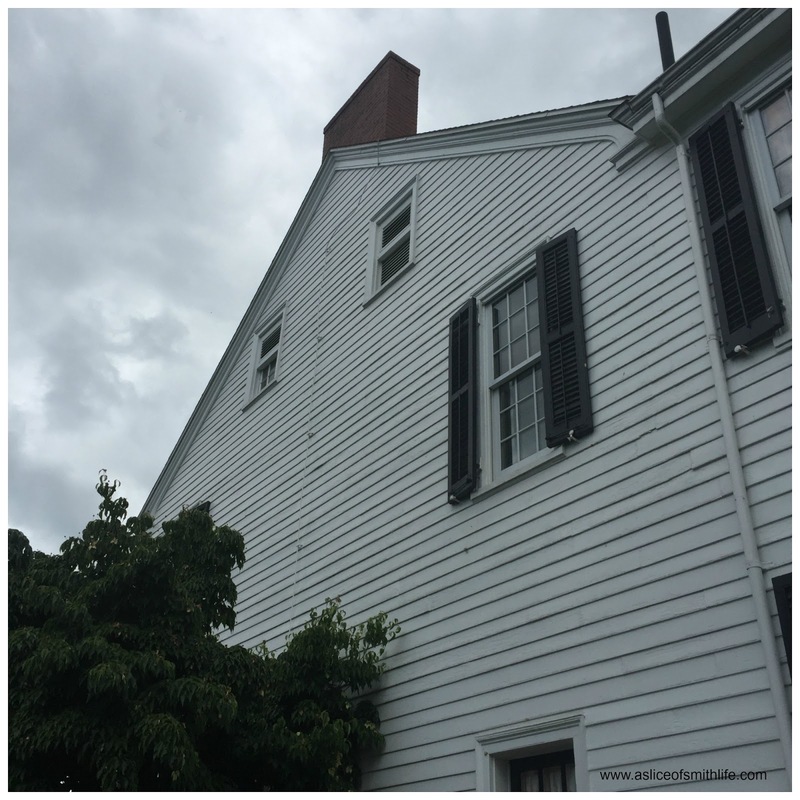 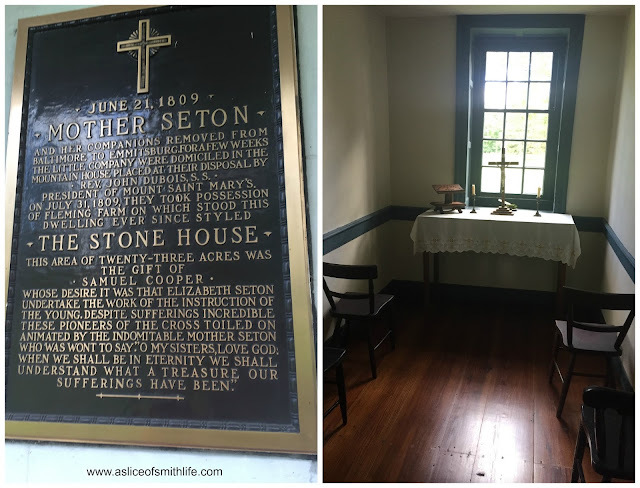 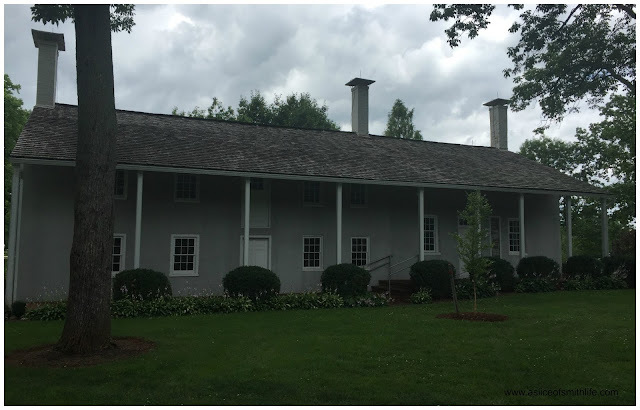 The Stone House was one of the first homes Elizabeth Seton lived in during her time in Emittsburg, MD. 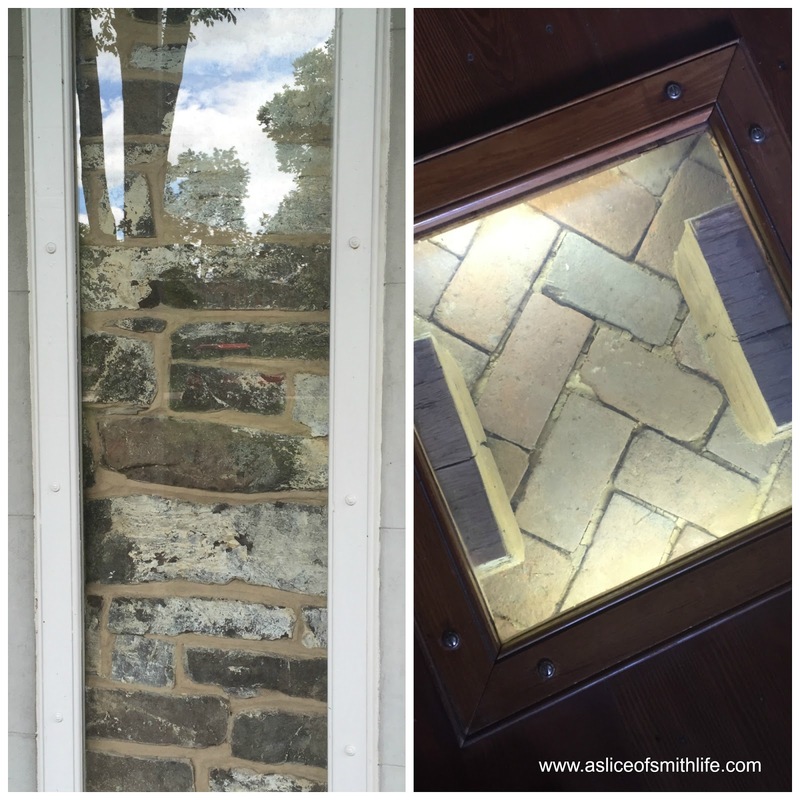 The photo on the left shows the original stone work on the outside of The Stone House, while the photo on the right shows a section of the original stone floor in The Stone House. 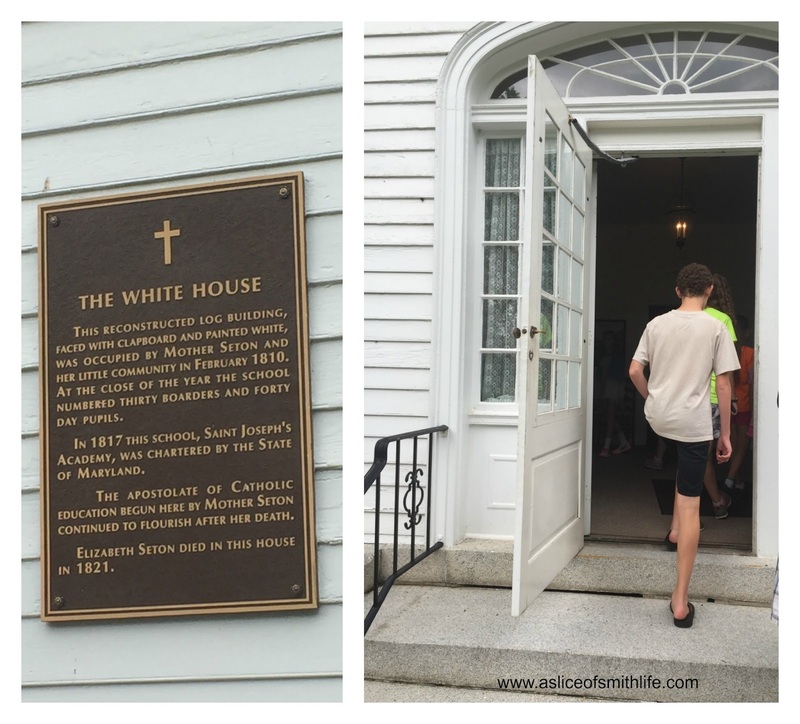 The White House was built in 1810 and it served as the first community of Sisters who lived in the property, the Sisters of Charity. Beautiful little chapel where Mass was said in the house. 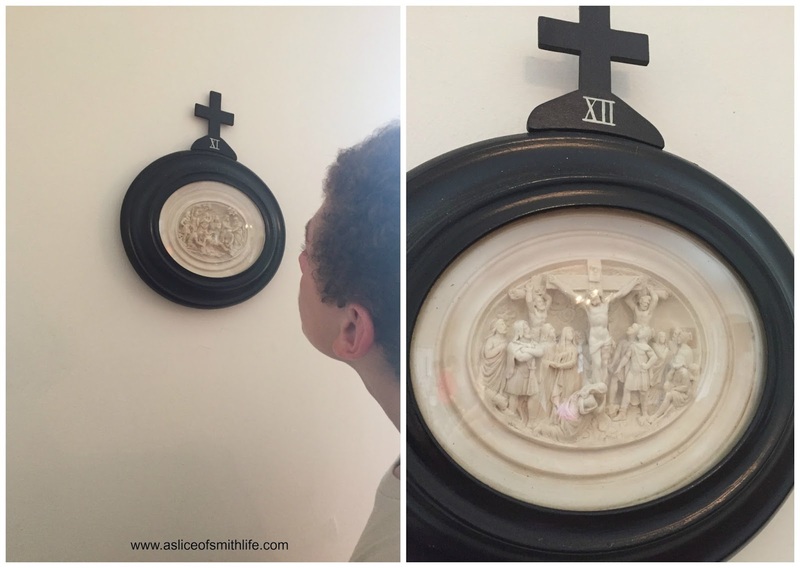 The Stations of the Cross that hung on the walls around the chapel were carved by hand and imported from Germany. The detail of each figure, especially their faces, was amazing! 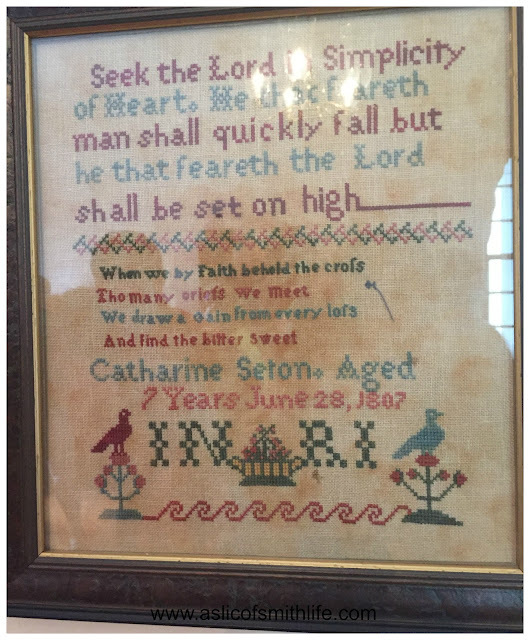 This is hanging on one of the walls and Catharine Seton (St. Elizabeth Ann Seton) hand stitched this in 1807 at the age of 7. This is the room that St. Elizabeth spent her final days. She wanted her bed placed in the corner and the picture of Jesus in the bottom right corner hung across from her bed because that is Who St. Elizabeth wanted to see as soon as she woke up each morning. 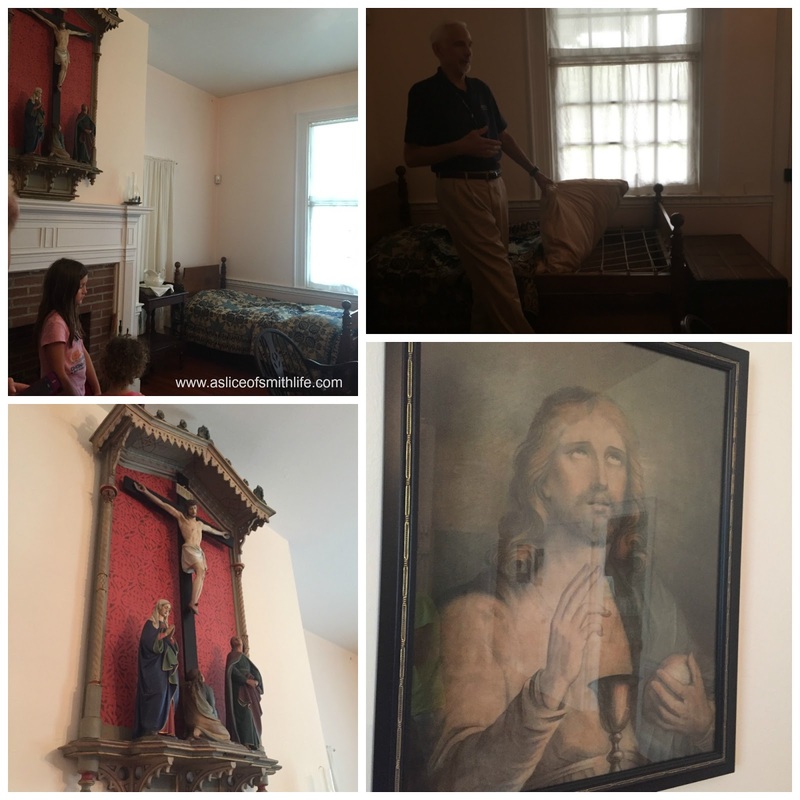 Our tour guide is lifting up the mattress and explained that the beds were lined with ropes. 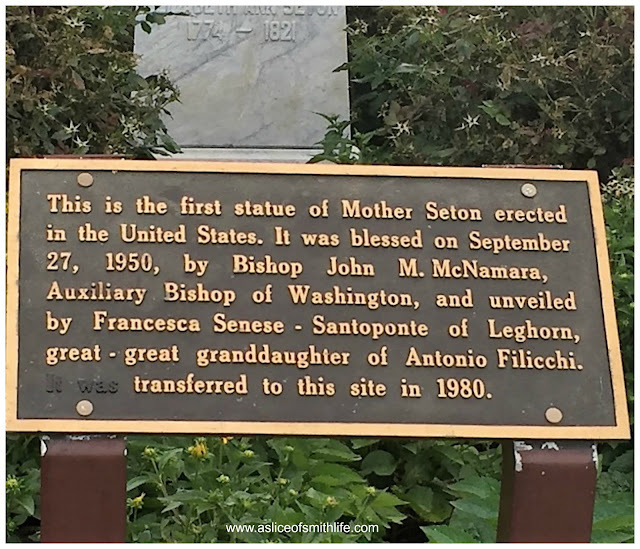 Under Mother Seton's mattress were ropes tied together for support and our tour guide said that's where the expression "Good night, sleep tight! " 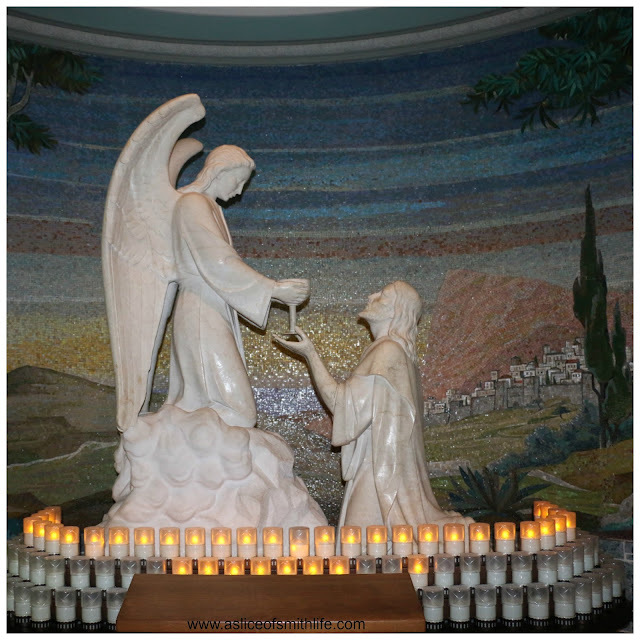 comes from. 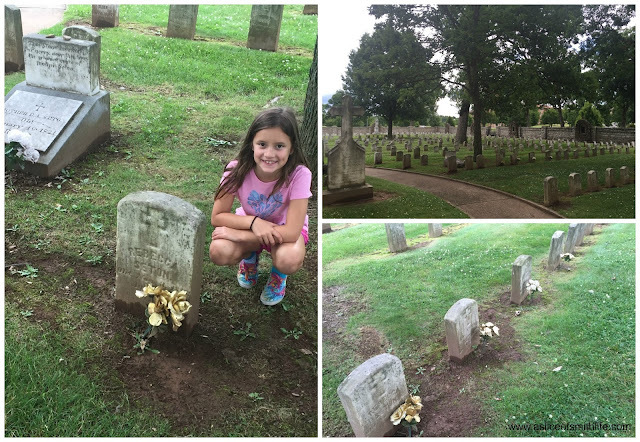 Our daughter, Rebekah, wanted a photo next to Rebecca Seton's grave site. Rebecca Seton was 14 when she died and she was the last child that St. Elizabeth lost. 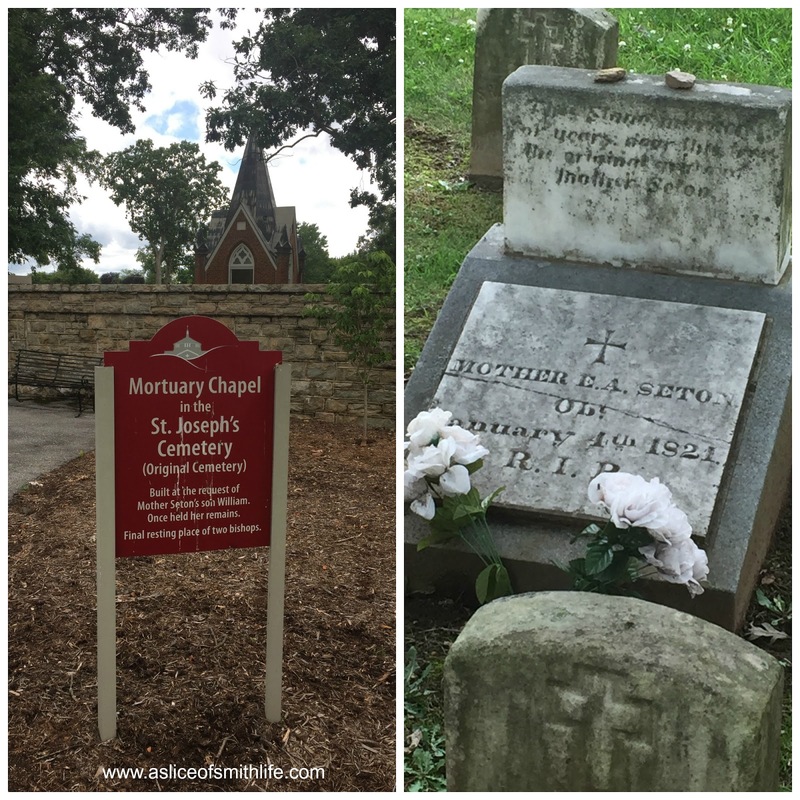 In the bottom right photo are grave sites of some of St. Elizabeth Seton's relatives, including another daughter. 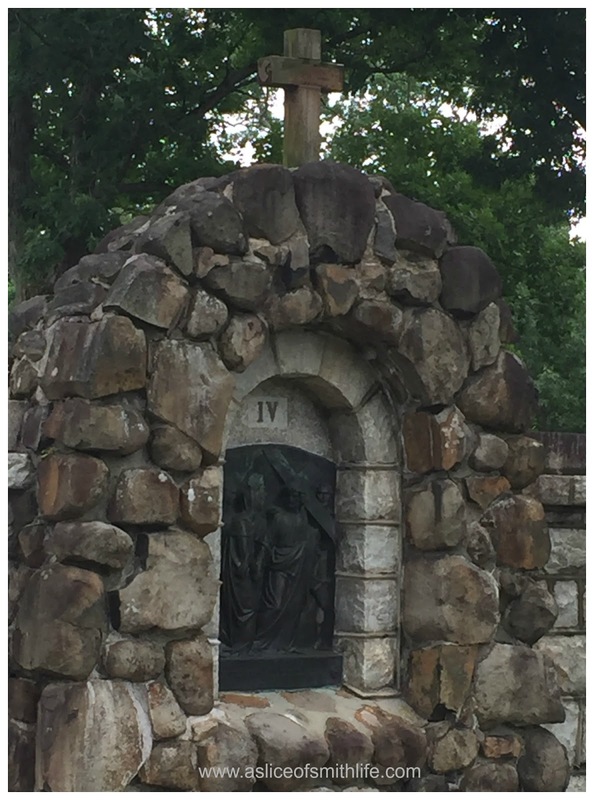 Surrounding the cemetery were these beautiful stone Stations of the Cross. 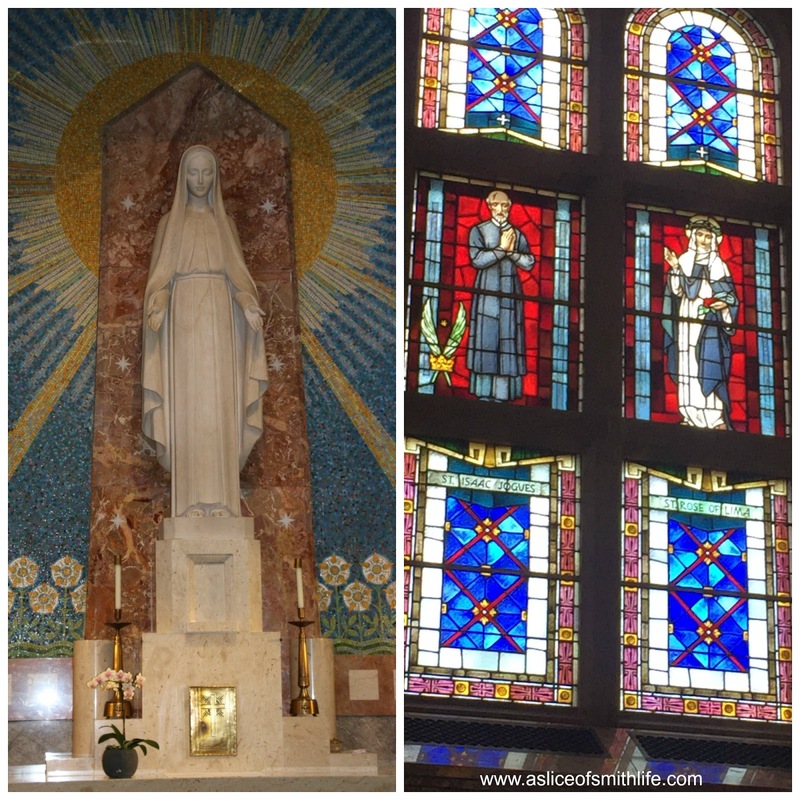 We then entered the Shrine and saw such goodness, beauty and art! 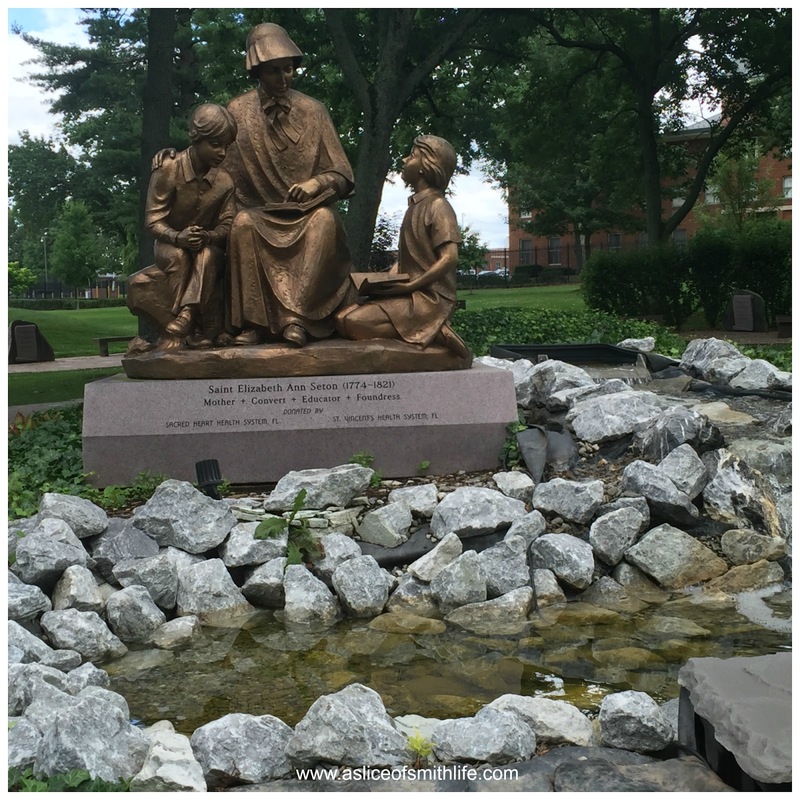 A little piece of Heaven on earth! Beautiful mosaics on the walls filled the shrine everywhere! 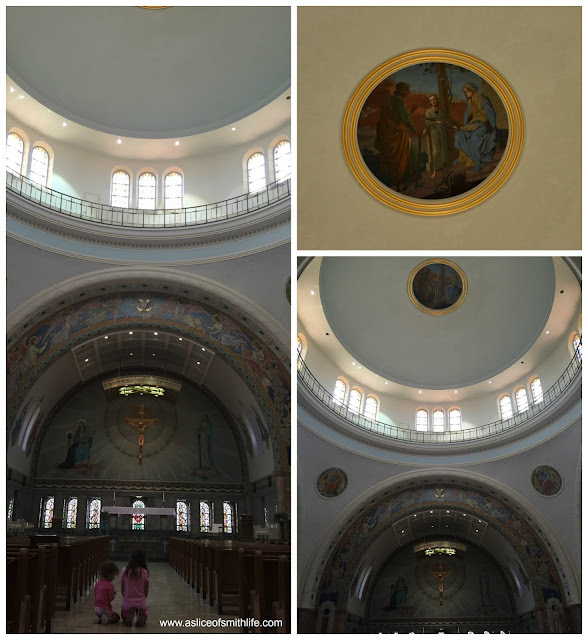 In the center of the ceiling was this round painting. It is the only painted art in the Shrine since the rest of the artwork is made with mosaics. The female Saint on the right of the stain-glassed window is St. Rose of Lima, who our 8 year old daughter is named after for her middle name. 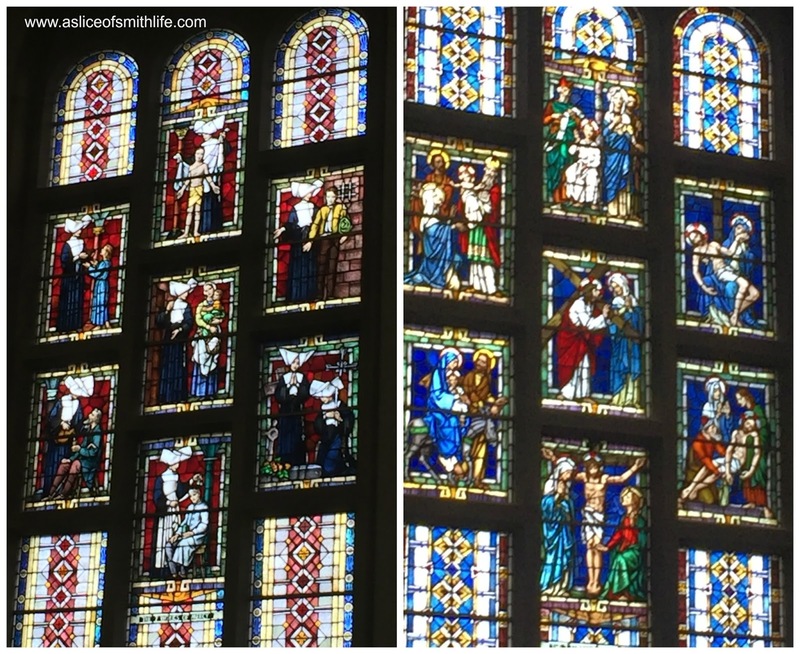 So our daughter insisted we take a photo of this glass pane in honor of her patron Saint. The left stain-glassed windows represent each of the Corporal Works of Mercy. The right side represent the Seven Sorrows of Our Blessed Mother. 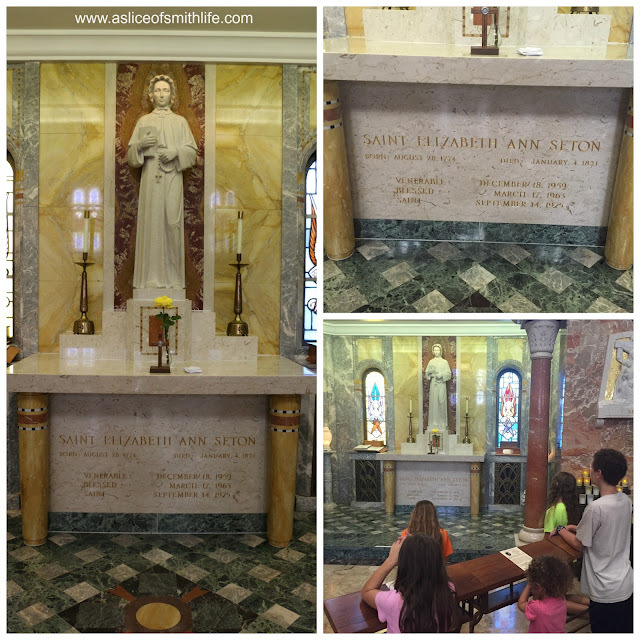 On the side altar is the final resting place of St. Elizabeth Ann Seton's remains. On the middle of the table there is a small wooden cross placed in front of the yellow flower. In the center of the cross is a first class relic of St. Elizabeth Ann Seton. 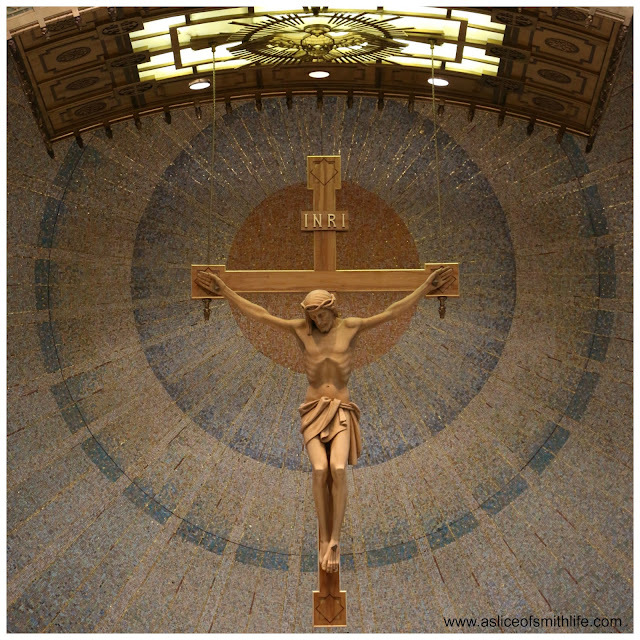 The tour guide told us he thinks a piece of St. Elizabeth's hair is in the center of the cross. 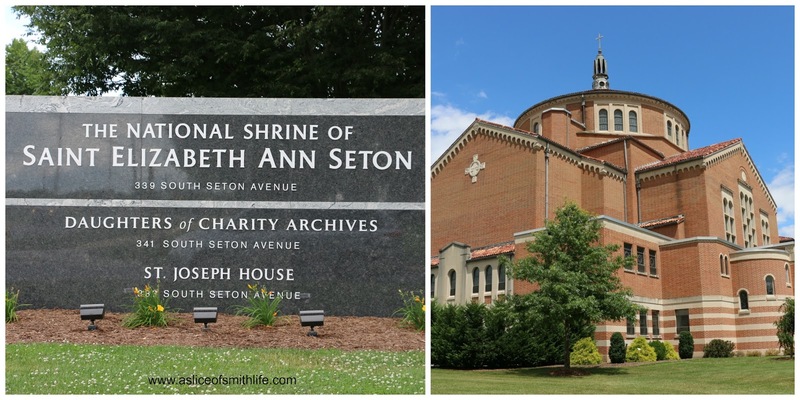 We had a wonderful visit to the National Shrine of St. Elizabeth Ann Seton! I hope we can go back again someday! 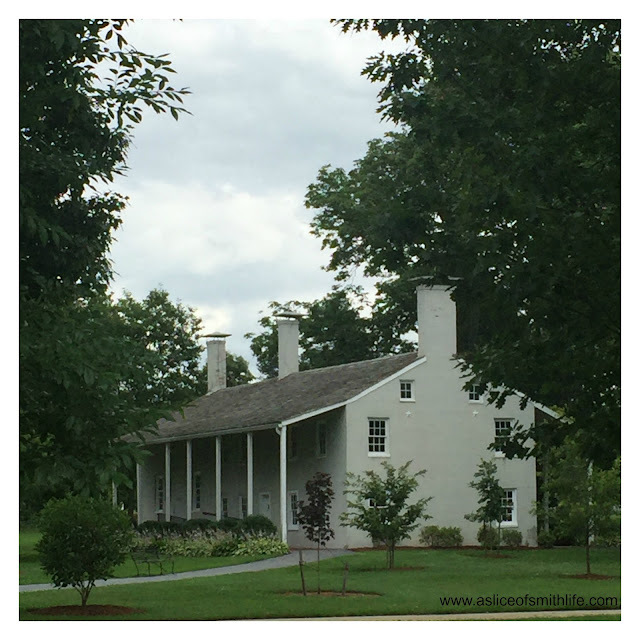 We got back in the car and then drove to Gettysburg, PA as our family continued our way up to Massachusetts.